New Mexico's state archives offer a rich collection of documents from the Spanish, Mexican, and Territorial periods. Robert J Torrez has mined this collection to produce a series of thirty-six articles that give us an idea of the stark reality of everyday life: what ordinary people went through to feed and protect their families, keep warm, worship their God, deal with government bureaucracies, and enjoy a few of life's pleasures. Previously published in periodicals with small local circulation, these essays are now available to the broader audience they deserve. The essays are divided into five groups. Part 1: ""Glimpses of Daily Life"", includes such topics as arranged marriages, conflicts over taxes and water, and weaving in New Mexico. Part 2: ""Indian Relations"", shows us visits and battles with Navajo, Ute, and Pueblo people. Part 3: on ""Crime and Punishment"", comprises essays on hangings, poisonings, and outlaws. ""The Territorial Topics"" gathered in Part 4 is a melange of entertainment, travel, and government matters, from the oddity of ""UFOs over Galisteo"", in which a Chinese balloon seems to have made its way to New Mexico in 1880, to the arrival of stagecoaches, telegraphs, and a circus. Part 5 presents biographical sketches of seven famous and not-so-famous New Mexicans. These historical vignettes paint an intriguing picture of New Mexico's varied past from the Spanish Colonial era to the Territorial period. "In an extraordinary case from 1744, Juana Martin the wife of Joseph de Armijo accused him of carrying on an affair with Getrudes de Segura. When the investigation was concluded, the offending couple was found guilty and Getrudes sentenced to exile at El Paso del Norte for four years. Armijo was allowed to remain in Santa Fe, but was assessed the expenses of Getrudes's trip to El Paso. The formal sentence pointed out Armijo's failure to live up to his responsibilities as a husband and ordered him to live amicably with his wife during Getrudes's period of exile." 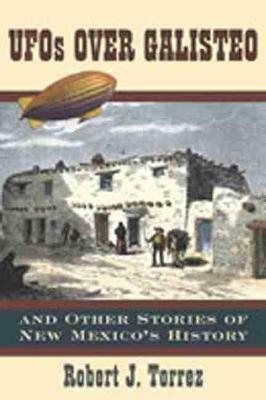 ""UFO's Over Galisteo" belongs on the bookshelf of everyone interested in the history of New Mexico." ." . an interesting and fun book with 36 vignettes of little-known people, events and practices from New Mexico history. . . a keeper as a unique perspective on New Mexico history." ." .T&#0243rrez has succeeded in not only compiling a collection of true-to-life New Mexican episodes, but keeps readers turning pages. . . Hats off to T&#0243rrez, whose love of history has resulted in one of the best historical volumes to come along in a long time. Let's just hope this is the beginning for this leaned historian and reasearcher. It's a real meat-and-potatoes kind of book. If you miss it, you miss out." ..."Trrez superbly demonstrates the remarkable variety of material and stories that can be gleaned from an archive." "[T&#0243rrez] offers an illuminating, engaging and documented picture of early New Mexico." .,. "Trrez superbly demonstrates the remarkable variety of material and stories that can be gleaned from an archive." Robert J Torrez is retired state historian of New Mexico. He lives in Albuquerque.